«After being baptized he decided to return to Africa, to his own house and inheritance, together with some companions and friends. There, for almost three years, free from secular concerns, he lived for God in the company of the friends who had joined him. Given over to prayer, fasting and good works whilst meditating day and night God´s law. What God revealed in prayer and reflexion he shared with those present and absent through speech and word» (4). Baptism of Augustine. Tomb of Saint Augustine. Pavia (Italy). The lack of information about the concrete life of this group has fed a polemic debate about their juridical and spiritual standing. Some authors do not see in Thagaste either monks or a monastery. It would have been a “simple house of philosophers”, “a learned brotherhood” or “a gathering of ascetics”. 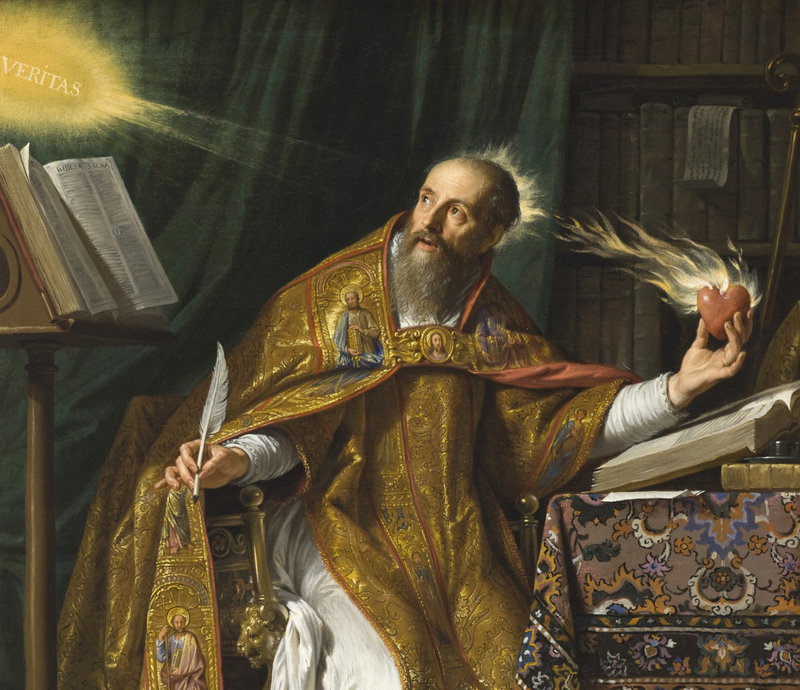 The letters and works of Saint Augustine could reflect an otium more fitting for philosophers than monks. Neither Augustine nor Possidius use the term monasterium to refer to Thagaste. Also, it may have been only Augustine who came to renounce his goods. Other writers concede more importance to the Augustinian “proposition” to renounce all secular hope in order to dedicate oneself exclusively to God´s service. 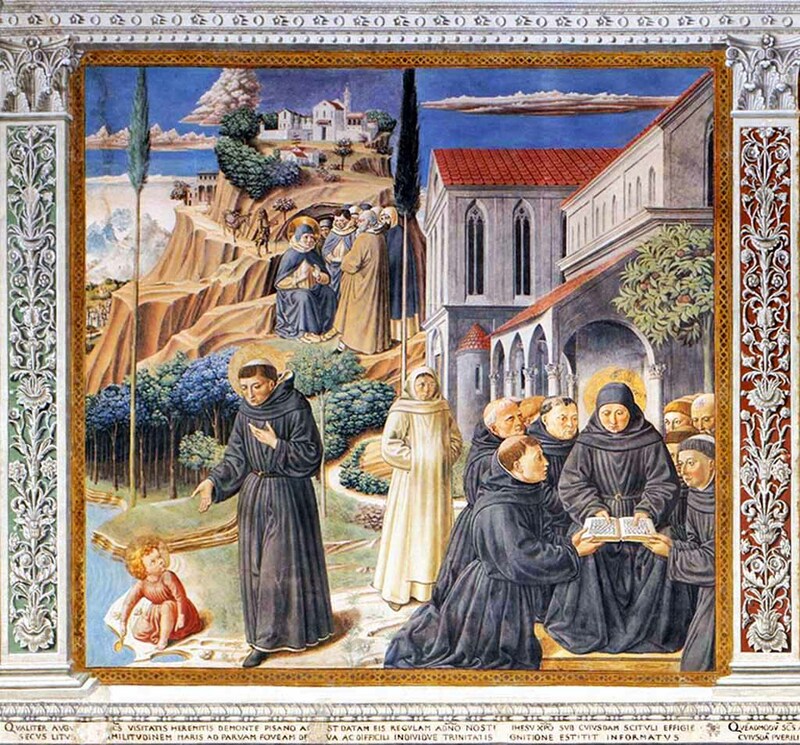 This was something enriched and purified by his study of monasticism during his stay in Rome. This is evident in his consciousness to belong to the category of the servants of God; the distinctive characteristics which colour the really wise; the ecclesiastical character and literary production; his condition as an ex- Manichean and the description of Possidius. This second opinion seems to be the more certain. In the West the limits between ascetics and monks were not yet sufficiently outlined. The term monasterium was not yet common nor had it yet acquired a universal sense of meaning. «Ordained priest, he established immediately a monastery in the Church and started to live with the servants of God according to the way and the rule established by the apostles. The fundamental norm in that society was that no one would possess anything for himself, rather that all would be common and would be distributed to everyone according to his needs, according to what he had practiced before, after returning from Italy to his native land.» (6). Handing over the Rule. Tomb of Saint Augustine. Pavia (Italy). The Rule, probably written for this monastery around the year 397, the brief treatise De opere monachorum and, less so, other writings of the Saint permit us to penetrate a little into the monastery’s organization. In charge of the monastery was the superior, that is to say, a lay monk in charge of maintaining discipline and the spiritual formation of the brothers. Others looked after clothes, medicines, the library, etc. Ordinarily, the monks went as a community to the Church of the city to take part in the Eucharist and other liturgical services. But within the monastery they had an oratory set aside exclusively for prayer. Their day was distributed into prayer, work, almost always manual, and reading. The parable of the Holy Trinity. Church of Saint Augustine, San Gimignano, Siena, Italy. Benozzo Gozzoli, XV century. The monastery quickly converted itself into an authentic mosaic of human characters. Its inhabitants were very different from each other in age, education and social extraction. The majority came from the lower straits of society. 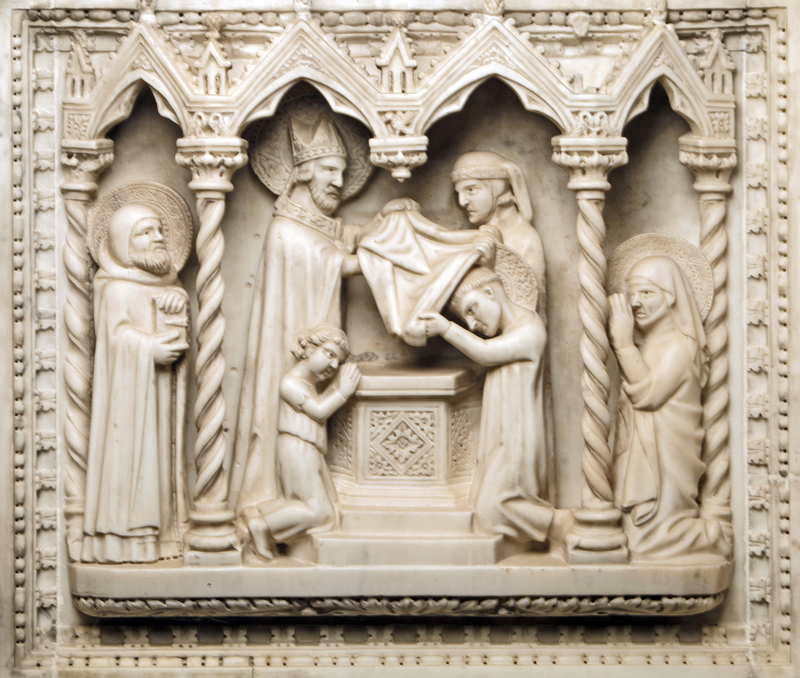 Augustine talks of slaves, freemen, agricultural workers, tradesmen and artisans. But there was no shortage of members from well-off families and even senatorial families. There were intelligent monks and ignorant monks, although the illiterate had to constitute a small proportion. Also age varied, and there is evidence of some children and youths. It seems that these entered as pupils and only at sixteen or 18 years of age it was decided their definite incorporation into the monastery or their return to secular life. 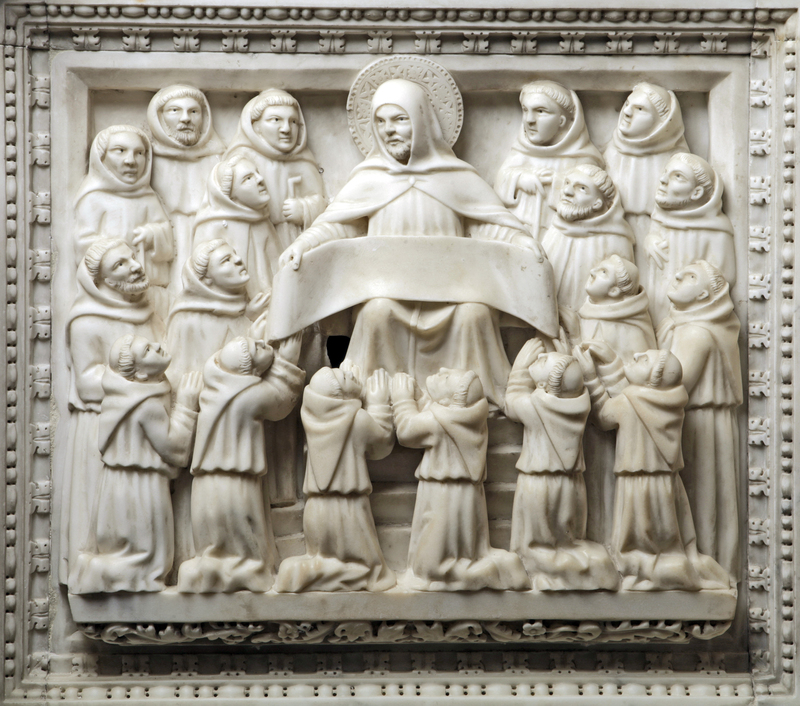 Almost all were lay monks, but with time there would enter clerics, and later some monks were added to the clergy. Monks from this monastery were Evodio, Possidius, Severo, and Anthony, Bishops respectively of Uzala, Calama, Milevi and Fussala. The fundamental ideal continued to be the same as in Thagaste, although more incorporated into the local ecclesiastical structure and enriched by the pastoral experience of Augustine and by his systematic study of Saint Paul. Augustine continued to yearn for the caritas veritatis, that is for retreat, contemplation, the study of Scripture and personal sanctification. But the reminder of the Passion of Christ, the example of the Apostle, the pastoral labours, and his ardent heart came to liberate his “spiritual egoism” helping him to leave behind the narrow limits of the monastery and to discover every day with greater clarity the demands of charity - necessitas caritatis. The Church is a mother that needs our help in her sublime mission, to illuminate sons for Heaven. We would not be good sons if we rejected her. As a consequence the monk should know how to renounce his pursuits, although with discretion and only if the Church requires his services: “If mother Church would desire your collaboration do not give it with covetous arrogance nor reject her with lazy negligence.” (Epistle 48, 2). «The love of truth searches for holy leisure; the necessity of love accepts the just exchange. If no one imposes upon us this responsibility we should dedicate ourselves to the search and contemplation of the truth. But if it is imposed upon us we should accept it for the necessity of charity. Moreover not even in this case is it right to abandon the delight of the truth, so that denied of its sweetness we should be weighed down by necessity» (7). This phrasing seems restrained and could induce the thought of a certain apostolic coldness by the saint. But his whole life leaves without any foundation the suspicion over his apostolic zeal. As a faithful son of the Church he felt obliged to go out in search for the lost sheep, without the right to retreat neither in the face of thieves nor in the face of wolves. «There are also stubborn sheep. When you search for them being as they are lost they say in their error and for their damnation that they have nothing to do with us: “Why do you want us? What are you looking for?”As if the reason that moves us to want them and to search for them were not their error and sense of loss. They say: “If I am in error, if I find myself to be lost why do you want me?” Because you are in error I want to call you again; because you are lost I want to find you. […] I have to call the erroneous sheep, I have to look for the lost; if you want it or not I have to do it. And although in the search I tear my flesh among the thorns of the forest I will strain amongst all the narrow straits and throw down all the enclosures. Whilst the Lord, who terrifies me, gives me strength I will resort to whatever means necessary. I will not cease to call the lost sheep, to go in search after the one who is lost. And if you cannot endure me, you will not stray nor perish» (Sermon 46, 7, 14). «I came to be a Bishop and realized that a Bishop had the obligation to show himself to be human and well-mannered with those who visited him, and if he failed in this obligation they will accuse him of being discourteous. But as such a movement of people did not fit well with the style of life of a monastery I opted to establish a monastery of clerics in the bishop´s residence» (Sermon 355, 2). Saint Augustine, by Philippe of Champaigne. About 1650. Los Angeles County Art Museum, United States. In another place he explains with greater clarity his thought […] saying of himself: I didn´t search for my own good but rather that of others, so that they might be saved (Ibid 33).This Peter would not have understood when he desired to stay with Christ on the mountain. Christ reserved this for you, oh Peter, after death. Now he says: “go down to work upon the earth, to serve on earth, to be despised and crucified on earth.”Does life become downgraded at their being death; bread for the existence of hunger; the road for tiredness; the fount for being thirsty; and you refuse to work? Do not look for your own well being. Be charitable, preach the truth: for that you will arrive at eternity, where you will find rest » (Sermon 78, 6). Regarding poverty Augustine was staunch. He saw individual poverty as an indispensable condition and a sign of the meeting of hearts. Without it the common life was impossible, now that private property concentrated man on himself and on material goods, which lead inevitably to individualism and dissension. Meals were always had in common. It seems they had only one meal a day, the coena which was served at about three o´clock in the afternoon. Those who could not fast were allowed to take something at midday. During the meal they read, talked and discussed. Some of the works of the Saint had their origin in these informal chats with the brothers. The food was frugal, with an abundance of vegetables and green foods. Sometimes they served meat; and always wine. The presence of guests was not uncommon. This same simplicity was used for clothes, shoes and the household furniture. Augustine was not happy either with neither costly things nor those too basic. This moderation is one of the great contributions to Western monasticism, in that he flees from extravagance and exaggeration and reduces penance to charity. In meals, work, bathing and in all things the strength of every monk has to be considered. Monks should make an effort to form part of the community, but custom and weakness give him a right and an exceptional treatment. Charity loves the individual monk, respects his personality and concerns itself to not convert him into a mere number. Saint Augustine was a passionate promoter of the female religious life and an admirer of its beauties. He founded monasteries of virgins and widows, and disseminated the ideals of virginity and continence, singing its praises, expounding its theological foundations, and his teaching found an unsuspected echo amongst the faithful. «Among the many scandals which are heaped upon this world I used to find consolation in your numerous community, in your chaste love, in your holy life, in the special grace which God has given to you that not only would you show contempt for bodily marriage but that also you would opt for living united in one house with one soul and one heart directed towards God» (Epistle 211). But in agreement with the legislation of the time he visited them rarely. Not even during the disturbances that in the year of 423 troubled profoundly the life of the community did he feel the need to be present. He was satisfied with sending a letter in which he lamented the disturbance and ordered the community to change its attitude. Of its daily life and spirituality we know very little. Probably it would not differ greatly from that of the monks. They practiced the perfect common life that Augustine put above even virginity, and they divided the day between prayer and work without excluding children’s education and maybe reading and the copying of manuscripts. At the front of the community was the female “superior”, maybe for life, and another superior who was probably a priest. The number of nuns should have been quite high. The majority were virgins, but there were also widows. Augustine´s sister entered upon the death of her husband. (4) San Posidio, Vita 3: pl 32, 36. (5) Ibid 5: pl 32, 37. (7) De Op. monach. 29, 37: pl 40, 576.